Inverted Pleat Drapes. Designed by Megan Pflug for One Kings Lane editor Dickson Wong. Photo by Genevieve Garruppo. If your bedroom has a challenging layout or unique windows, deciding on window treatments can be difficult. 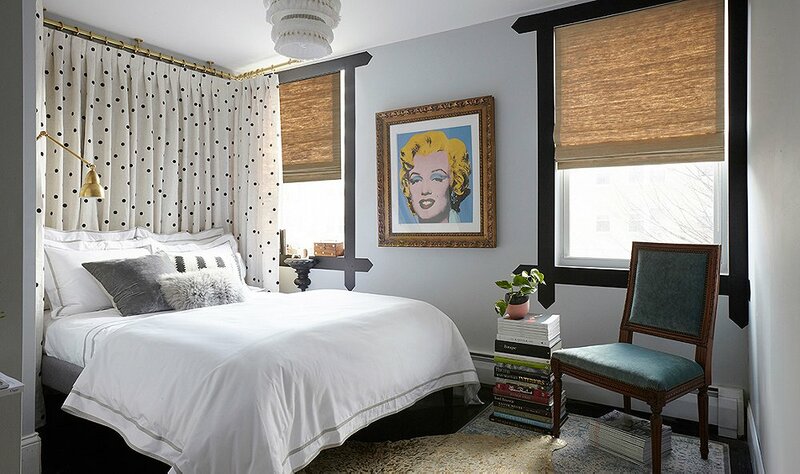 We’re here to share with you some innovative design ideas for using drapery and curtains in the bedroom, including locations you may not have thought of to mount hardware and hang drapes. Drapes and curtains can be used in places other than windows to make a big statement in the bedroom. One lovely option is to create a wall of drapery behind the bed. For One Kings Lane editor Dickson Wong, designer Megan Pflug came up with this design to save space in his small New York City apartment. The ceiling mounted Inverted Pleat Drapery gives the illusion of a headboard while saving space. Ripple Fold Drapes. 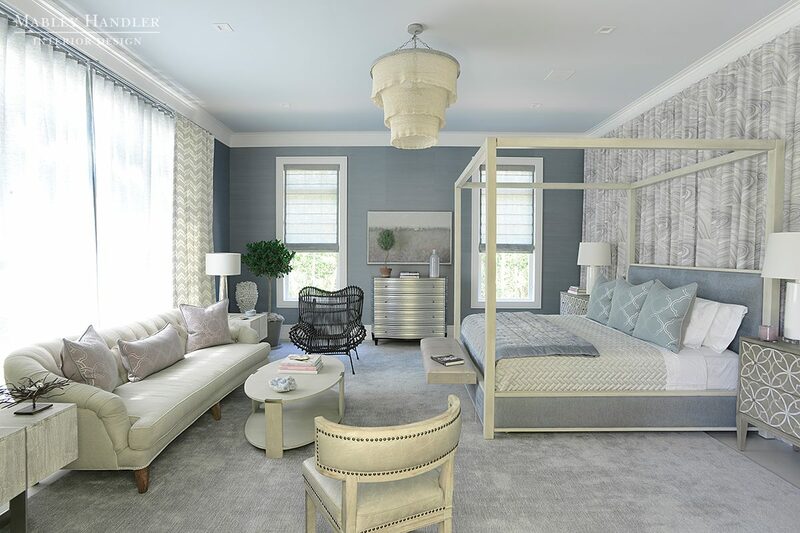 Designed by Mabley Handler for the 2016 Hampton Designer Showhouse. 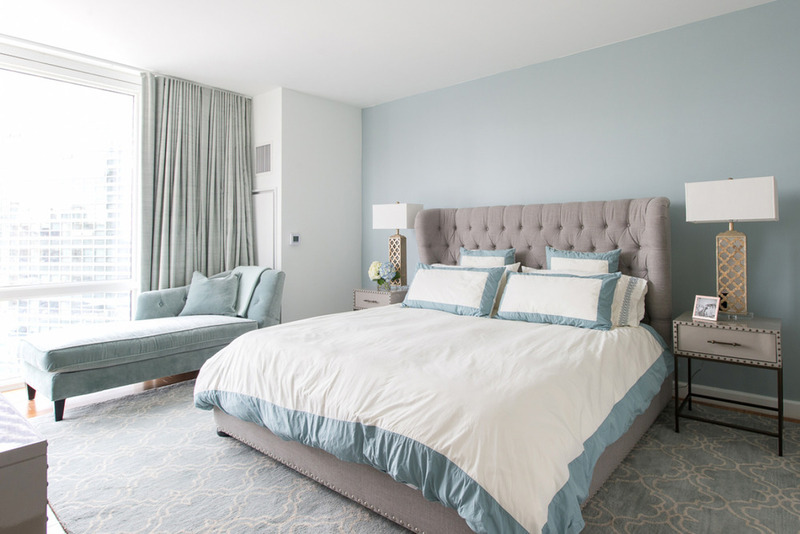 In the opposite situation, design team Mabley Handler created a wall of drapery behind the four poster bed in this master bedroom they designed for the 2016 Hampton Designer Showhouse. Hanging artwork can be tough within the confines of a four poster bed with a canopy, so the bedroom drapery created a statement piece out of the entire wall, and echoes the softness of the contrasting drapes covering the windows on the opposite wall. Take note of how none of the fabrics in this room match exactly; stick to complementary tones and don’t be afraid to mix patterns and colors! Ripple Fold Drapes. Designed by Chudin Design Collective for Homepolish. Photograph by Sammy Goh. Corner windows are always problematic to treat. Where does the hardware go? How do you make the window treatments meet gracefully in the middle? 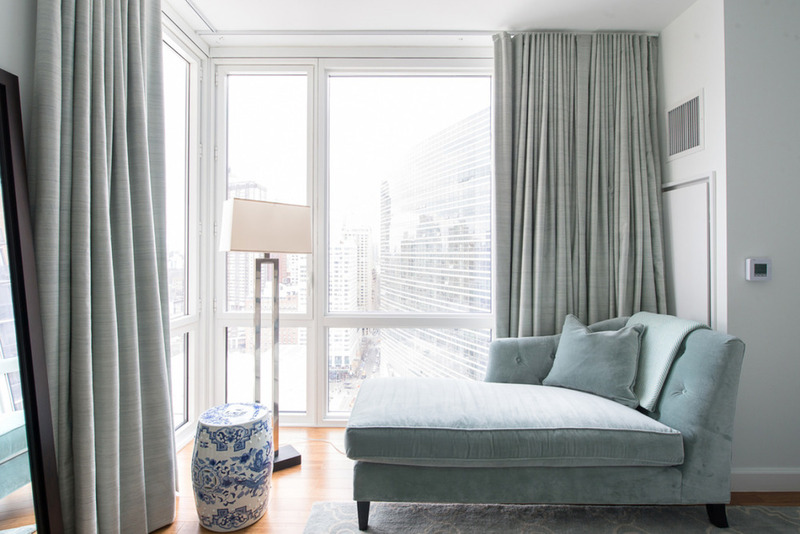 Chloe Chudina chose lush Ripple Fold Drapes for this Lincoln Center Apartment’s floor to ceiling corner windows. When you look at the ceiling, you can see a Track mount system that meets in the corner of the bedroom, allowing the drapes to pull close and cover both sides of the windows. The Shade Store offers multiple styles of Track drapery hardware systems in several colors and finishes. The white track blends into the ceiling of this bedroom, letting the drapery fabric and generous stack speak for themselves. Arched windows provide amazing architectural interest and maximize natural light, but always present dilemmas for how to hang window treatments. Above the arch or below? In this dreamy all white bedroom, Kimberly Loutzenhiser of kalHome hung Pinch Pleat Drapes just below the arched transom of the window. This setup provides privacy for the homeowners when the bedroom drapes are closed, while still allowing sunlight to filter in above the drapes during the day. If you need help with new bedroom curtains and drapes, our Design Consultants are ready and waiting for your call. We will develop a custom window treatment solution for your bedroom walls or windows that creates the look you’ve been dreaming of. Visit us in a showroom or contact us today. Want more inspiration about bedroom curtains and drapes? Visit our bedroom window treatment photo gallery to see more pictures. To find the perfect window treatments for your bedroom, order your free swatches or stop into one of our showrooms and talk to a Design Consultant.